Do you just want to download the music? If so you can just buy the music and download it. 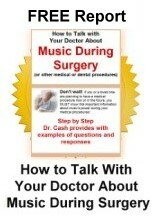 Surgical Serenity Solutions is a subsidiary of Healing Music Enterprises. Note: Payments are made through PayPal. You do NOT need a PayPal account in order to make a purchase on PayPal. We stand behind our products 100%. We test each one before it is shipped but we also understand that from time to time a problem may occur. We will be happy to fix the situation if one of our products is damaged or not working properly. Send us a complete statement of what the problem is. Please do not return the product without the authorization. When you receive your authorization, return the headphones, USB cable, and the original packaging. Upon receipt, we will replace or repair the product. Hospital Products have special requirements for infection control. Headphones should be checked upon receipt. Any defects will be handled before the item is used in the hospital. Please remember to return all items that were included in your original shipment. Missing items will cause a delay in processing your return.